I love makeup. I love reading about it, watching people talk about it on YouTube, and wearing it myself. But in the real, everyday world, the makeup I wear rarely changes. I've found my groove of 'foundation, a bit on the eyes, natural lipstick' and whilst it isn't too exciting, it is fail safe. With that being said, I do have a few new additions to my everyday makeup and they've quickly become favourites. Zara perfume, Black Eau de Toilette - I won't even begin to try and describe this scent in my own words, but thankfully Zara themselves describe it as Oriental Orange, Vanilla, Cinnamon and Musk. I think it smells heavenly, and I love Zara fragrances. They might not have the all-day lasting power of a pricey perfume, but they're always priced below a tenner and they're perfect for everyday. Benefit They're Real! Primer - I literally can't get enough of this stuff and my little sample is about empty. It's so good that I'm considering shelling out on the full size version. It works wonders on it's own, but I love what it does to my lashes when I pair with a mascara (at the minute I'm using the Maybelline Lash Sensational). I think lots of the wonder in this product is the brush. It's the same as the standard They're Real mascara wand, which I love. It leaves my lashes separated and lengthened, but most importantly, they have so much more volume. Maybelline's Master Sculpt Contouring Palette - I love this palette for it's contour shade. Maybelline are so ahead of the competition with this contouring palette and it's great if you can't afford the wonders of Charlotte Tilbury, Kevin Aucoin etc. Something to mention is that I'm quite pale usually, and this does definitely create the most natural shadow when I'm wearing a little fake tan, but that's nothing a light hand and blending brush can't fix. I don't tend to use the highlighter though, as I find it doesn't give enough for my liking. Seventeen's Mirror Shine Lipstick in Beehive - You've heard this phrase a million times, but this lipstick is for me, a my lips but better and glossier shade. It doesn't last all that long, but on the everyday when you just want a little something on your lips, this is perfect. I'm not a fan of the scent so much (it's a bit nothing-y), but the formula makes up for that. Moisturising but not too shiny, and never clingy. 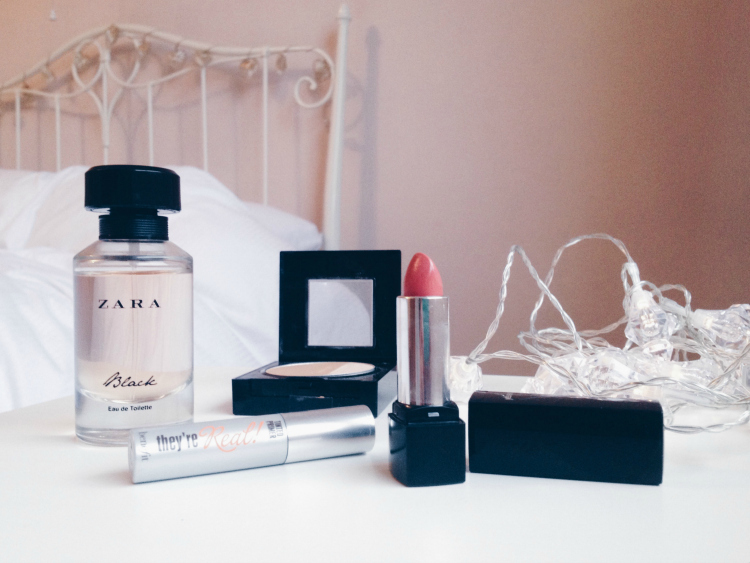 I am a lover of a good Zara perfume! Desperate to try the They're Real primer, I'm obsessed with their brown mascara. Air patrol is something I want to get my hands on at the minute, I love eyeshadow primer. I also recently tried L'Oreal's Makeup Setting spray (because I couldn't justify buying the UD one!) and it seems really good, something which you might like too!